Amazon Alexa is in almost everything from microwaves to wall clocks, and the latest addition to that list is a bike. The bike you can see above is part of a new range of cycling products coming later in 2019 called the Cybic Legend. 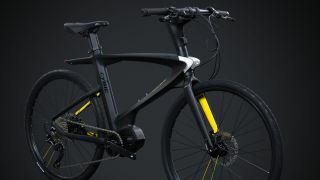 There's also an electric bike in development called the Cybic E-Legend and both have been announced ahead of being shown at CES 2019. These are set to be the world's first bikes that include Amazon's voice assistant, and it's there so you can interact with your bike without being distracted when you're meant to be concentrating on the road in front of you. For example, if it's starting to get dark on your way home you could have smart lights set up on your bike that you can ask Amazon Alexa to turn on using your voice rather than having to reach to hit a manual switch. The bike is also capable of giving you turn-by-turn directions as well as traffic and weather updates making it even safer to ride the bike. On top of that you'll be able to use other Alexa Skills so you'd be able to order food for when you get home, interact with a smart lock and play music directly from your bike too. So far we only know about a UK release for the bike range, but considering the product is set to be on display at CES 2019 in Las Vegas next week we'd expect it to come to the US too. If you live in the UK, it's set to be an exclusive at Halfords from summer 2019. Each bike will come with a Vodafone 3G SIM card so you can have the bike connected, and that will last for three years. The exact specifications of the bike range have yet to be confirmed, and we expect to hear more about that later in 2019 nearer the summer release date.